Adequate measures are taken to minimize the pollution & environment protection. Corrosion test is conducted only when specially requested by the client. With relevant standard i.e. ASTM A-450 and A-530 norms this ensures trouble-free expansion, welding and use at customers end. 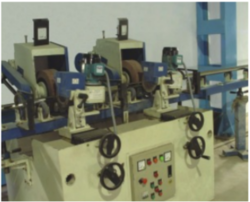 To detect homogeneities in subsurface, eddy current testing is carried out using Digital Flaw-mark Testing System. 100% Hydrostatic Testing is carried out according to ASTM-A 450 norms to check tubes for leakage. To ensure complete identification and traceability, all the information as required by the standards i.e. Brand Name, Size, Grade, Specifications, Heat no., Lot No. is marked on all the pipes and tubes by using the latest inkjet marking machine. Tubes are internally pressurized with clean and dry compressed air and being submerged in clear water to check any evidence of air leakage. After passivation, every single length of tubes and pipes is subjected to a thorough visual inspection by trained staff to detect surface flaws and other imperfections.